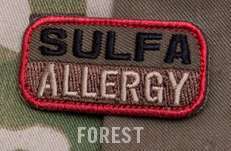 Sulfa Allergy - Color : Forest. Based on our bloodtype patches, we expanded into allergy patches. Camo variants all have a red border to grab attention up close, however don't stand out from medium distances and beyond.